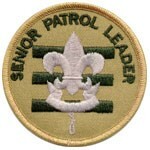 Description:	The Senior Patrol Leader is elected by the Scouts to represent them as the top junior leader in the troop. Comments:	The Senior Patrol Leader is the focal point of the troop. He needs to attend as close to all troop functions as possible. Not a member of a Scout patrol. Training:	You must attend the troop Junior Leader Training. Attendance:	You are expected to actively attend troop meetings, Patrol Leaders' Council meetings, outings, and service projects. If your attendance is low, you could be removed from office or lose credit for service. Effort:	You are expected to give this job your best effort. Uniform:	Set the example by wearing your uniform correctly. This means that you will wear all of the parts of the troop uniform, shirttail tucked in, with all required badges in their correct locations. Behavior:	Set the example by living the Scout Oath and Law in your everyday life. Show Scout Spirit in everything you say and do. Attendance:	Set the example by being an active Scout. Be on-time for meetings and activities. You must call the Scoutmaster if you are not going to be at a meeting or if you suddenly have to miss an outing. You also need to make sure that the Assistant Senior Patrol Leader is ready to assume your responsibilities. Runs the Patrol Leader's Council meeting. 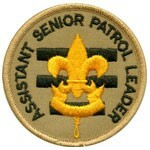 Description:	The Assistant Senior Patrol Leader is the second highest ranking patrol leader in the troop. The Assistant Senior Patrol Leader acts as the Senior Patrol Leader in the absence of the SPL or when called upon. He also provides leadership to other junior leaders in the troop. Comments:	The most important part of the ASPL position is his work with the other junior leaders. The ASPL should be familiar with the other positions and stay current with the work being done. Not a member of a Scout patrol. Attendance:	Set the example by being an active Scout. Be on-time for meetings and activities. You must call the Scoutmaster if you are not going to be at a meeting or if you suddenly have to miss an outing. You also need to make sure that someone will assume your responsibilities. Description:	The Leadership Corps is elected by the Scouts or appointed by the ScoutMaster to serve as a foundation of leadership by older Scouts in the troop. 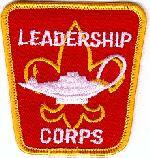 Comments:	The Leadership Corps buy into the Patrol Method and National Youth Leadership Training philosophy. They have proven out and continue to demonstrate leadership. They need to attend as close to all troop functions as possible. It is likely that Leadership Corps Scouts are also members of Crew 52. Not a member of a Scout patrol. Behaviour:	Set the example by living the Scout Oath and Law in your everyday life. Show Scout Spirit in everything you say and do. Never stop learning; be a life-long learner. Focus on the Little Things; that way the Big Things will happen. Description:	The Patrol Leader is the elected leader of his patrol. He represents his patrol on the Patrol Leader's Council. Comments:	The Patrol Leader may easily be the most important job in the troop. He has the closest contact with the patrol members and is in the perfect position to help and guide them. The Patrol Leaders, along with the Senior Patrol Leader and Assistant Senior Patrol Leader are the primary members of the Patrol Leaders' Council. Attendance:	You are expected to actively attend troop meetings, outings, and service projects. If your attendance is low, you can be removed from office or lose credit for service. Attendance:	Set the example by being an active Scout. Be on-time for meetings and activities. You must call the Senior Patrol Leader or Scoutmaster if you are not going to be at a meeting or if you suddenly have to miss an outing. You also need to make sure that the Assistant Patrol Leader is ready to assume your responsibilities. 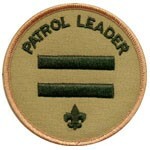 Represents the patrol on the Patrol Leader's Council. 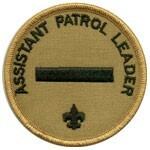 Description:	The Assistant Patrol Leader is appointed by the Patrol Leader and leads the patrol in his absence. Comments:	Substituting for the Patrol Leader is only part of the Assistant Patrol Leader's job. The APL actively helps run the patrol. Attendance:	You are expected to actively attend troop meetings, Patrol Leaders' Council meetings (when the Patrol Leader cannot attend), outings, and service projects. If your attendance is low, you can be removed from office or lose credit for service. Attendance:	Set the example by being an active Scout. Be on-time for meetings and activities. You must call the Senior Patrol Leader or Scoutmaster if you are not going to be at a meeting or if you suddenly have to miss an outing. You also need to make sure that someone will assume your responsibilities. Helps the Patrol Leader keep patrol members informed. Represents his patrol at Patrol Leader's Council meetings when the Patrol Leader cannot attend. Description:	The Troop Bugler should be able to make appropriate bugle calls, as requested, at troop activities. Comments:	Serving as Bugler can apply towards positions of responsibility requirements for Star and Life, but not Eagle. In many troops/teams the Bugler plays a trumpet instead of a bugle. Serving as Bugler is a requirement for Bugling Merit Badge. 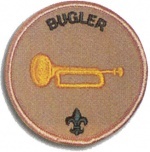 Being able to play a bugle or trumpet can be used towards requirement 1 of Music Merit Badge (Sing or play a simple song or hymn chosen by your counsellor using good technique, phrasing, tone, rhythm, and dynamics. Read all the signs and terms of the score). Boy Scouts or Venturers who are members of bands, drill teams, or drum and bugle corps affiliated with a unit or a local council may also wear the musician badge special insignia.. Experience:	One full year of scouting; an interest in playing and access to a Bugle or Trumpet is required. 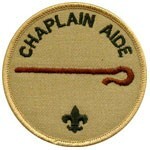 Description:	The Chaplain Aide works with the Troop Chaplain to meet the religious needs of Scouts in the troop. He also works to promote the religious awards program. Comments:	"Duty to God" is one of the core beliefs of Scouting. The Chaplain Aide helps everyone in the troop by preparing short religious observations for campouts and other functions. The Chaplain Aide does not always lead the observation himself and can have other troop members help. Experience:	One full year of scouting. 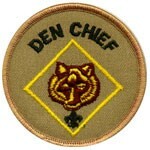 Description:	The Den Chief works with the Cub Scouts, Webelos, and Den Leaders in the Cub Scout pack. Comments:	The Den Chief provides knowledge of games and Scout skills that many Den Leaders lack. The Den Chief is also a recruiter for the troop. This function is important because no troop can thrive without new members and most new members will come from Cub Scouting. Experience:	The Den Chief provides knowledge of games and Scout skills that many Den Leaders lack. The Den Chief is also a recruiter for the troop. This function is important because no troop can thrive without new members and most new members will come from Cub Scouting. Training:	You must attend Den Chief Training. Attendance:	You are expected to actively attend troop meetings, outings, and service projects. If your attendance is low, you can be removed from office or lose credit for service. In terms of attendance with your den, you are expected to actively attend den meetings and pack functions. You must inform the Den Leader if you will be absent. Attendance:	Set the example by being an active Scout. Be on-time for meetings and activities. You must call the Senior Patrol Leader or Scoutmaster (or Den Leader, as appropriate) if you are not going to be at a meeting or if you suddenly have to miss an outing. You also need to make sure that someone will assume your responsibilities. 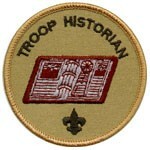 Description:	The Troop Historian keeps a historical record or scrapbook of troop activities. Comments:	The true value of a good Historian does not show up until years later. The Historian provides material for displays and presentations of current activities. In addition, the work of the Historian provides a link with the past. Experience:	One full year of scouting; an interest in photography is helpful. Gathers pictures and facts about past troop activities and keeps/posts them in a historical file, scrapbook, or ScoutLander Photo Gallery. 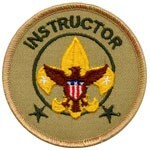 Description:	The Instructor teaches Scouting skills. Comments:	The Instructor will work closely with both the Troop Guide and with the Assistant Scoutmaster for new Scouts. The Instructor does not have to be an expert but should be able to teach the Scoutcraft skills needed for Tenderfoot, Second Class, and First Class ranks. The troop can have more than one instructor. Experience:	2 or more full years of scouting. Teaches basic Scouting skills to the troop and patrols. 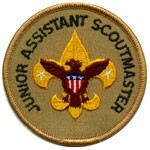 Description:	The Junior Assistant Scoutmaster serves in the capacity of an Assistant Scoutmaster except where legal age and maturity are required. He should be at least 16 years old and not yet 18. He's appointed by the Scoutmaster because of his leadership ability. Comments:	In many cases the JASM has the same responsibilities as an Assistant Scoutmaster. Attendance:	Set the example by being an active Scout. Be on-time for meetings and activities. You must notify the Scoutmaster if you are not going to be at a meeting or if you suddenly have to miss an outing. Description:	The Troop Librarian takes care of troop literature. Comments:	The library contains books of historical value as well as current materials. All together, the library is a troop resource worth hundreds of dollars. 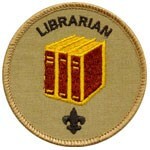 The Librarian manages this resource for the troop. Keeps a system for checking books and pamphlets in and out. Follows up on late returns. Issues vouchers for purchase of used merit badge books. Description:	The Leave No Trace Trainer specializes in teaching Leave No Trace principles and ensures that the troop follows the principles of Leave No Trace on all outings such as camping and other outdoor activities. Comments:	He can also help Scouts earn the Leave No Trace award. He should have a thorough understanding of and commitment to Leave No Trace. Ideally, he should have completed Leave No Trace training as well as earned both the Camping and Environmental Science merit badges. Training:	You must attend the troop Junior Leader Training. Successfully complete the official 16-hour Leave No Trace Trainer training course. A Scout under the age of 14, or who has not completed Leave No Trace Trainer training, may serve as an instructor teaching Leave No Trace skills until he obtains the necessary training. Helps minimize impact on the land by teaching members the principles of Leave No Trace and improving Scouts’ outdoor ethics decision-making skills. 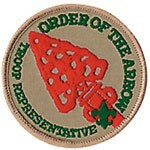 Description:	The OA Troop Representative is a youth liaison serving between the local OA lodge or chapter and his troop. In his unit, he helps meet the needs of the unit and will serve as a communication and programmatic link to and from Arrowmen, adult leaders and Scouts who are not presently members of the Order. He will do this in a fashion that strengthens the mission of the lodge, purpose of the Order and the mission of the Boy Scouts of America. Comments:	By setting a good example, he will enhance the image of the Order as a service arm to his unit. Serves as communication link between the lodge or chapter and the troop. Description:	The Troop Quartermaster keeps track of troop equipment and sees that it is in good working order. Comments:	This is one of the most critical positions in the troop. 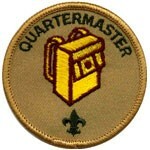 The Quartermaster does most of his work around campouts. There are times when the Quartermaster has to be available to check equipment in and out. Attendance:	YYou are expected to actively attend troop meetings, Patrol Leaders' Council meetings, outings, and service projects. If your attendance is low, you can be removed from office or lose credit for service. Gets the US, troop, and patrol flags for meetings and ceremonies and puts them away afterwards. Each patrol will elect an PQM to assist the QM in his duties and specifically ensure his patrol’s equipment is in serviceable condition and their patrol boxes are well supplied. Description:	The Scribe keeps the troop records. He records the activities of the Patrol Leaders' Council meetings. 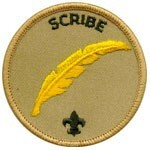 Comments:	To be a good Scribe you need to attend nearly all troop and Patrol Leaders' Council meetings. Attends and keeps a log of Patrol Leaders' Council meetings. Posts PLC meeting minutes on ScoutLander once approved by SPL. Works with the Troop Committee Secretary. 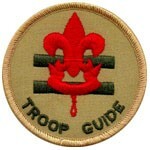 Description:	The Troop Guide works with new Scouts. He helps them feel comfortable and earn their First Class rank in their first year. Comments:	The first year as a Boy Scout is a critical time with new places, new people, new rules, and new activities. The Troop Guide is a friend to the new Scouts and makes first year fun and successful. This is an important position. Not a member of a Scout patrol. Experience:	3 or more full years of scouting; must have been a prior patrol leader. Attendance:	You are expected to actively attend troop meetings, Patrol Leaders' Council meetings, outings, and service projects. If your attendance is low, you can be removed from office or lose credit for service. Helps new Scouts earn First Class in their first year. Coaches the patrol leader of the first-year Scout patrol on his duties. Works with the patrol leader at Patrol Leaders' Council meetings. Attends Patrol Leaders' Council meetings with the patrol leader of the new Scout patrol. Description:	The Web Master ensures the information on the troop website is correct/current. Comments:	A troop committee may appoint an adult Webmaster to be in charge of the group's Web site. This is however not an official committee position. He/she works with the youth Webmaster on what's going on in the unit. The adult term is as long as needed; until a new webmaster can take his/her place. Training:	You must attend the troop Junior Leader Training and attain the BSA Cyber Chip. Works with various unit members on needed topics. Ensures the Web site is as youth-run as possible. Helps out Web site where needed. Comply with BSA policies on electronic publishing.